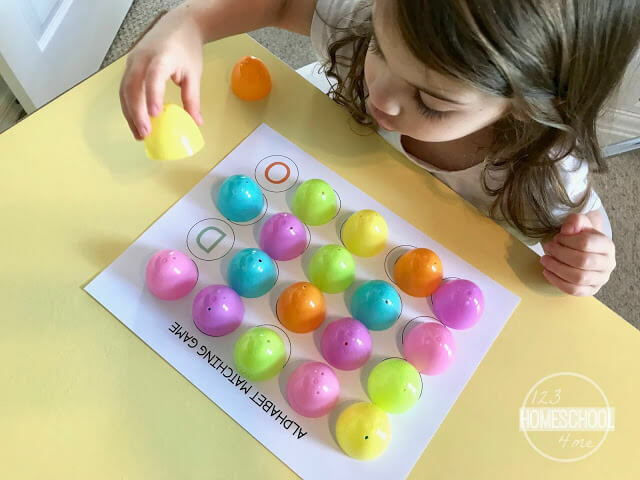 This is such a fun, easy alphabet game using leftover plastic Easter eggs and a free printable. This activity is perfect for toddler, preschool and kindergarten age kids! After Easter I feel like we’re swimming in plastic Easter eggs and I find them all over the house! I’m always looking for new ways to use them for learning activities all year long. 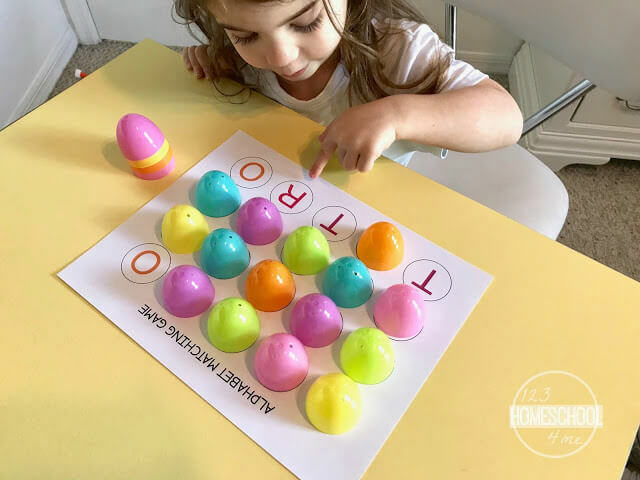 This After Easter Alphabet Matching Game is a fun way to practice letter recognition, matching, fine motor skills and FINALLY use those left-over plastic Easter eggs for something! It’s perfect for toddlers, preschool, pre-k, and kindergarten age kids. 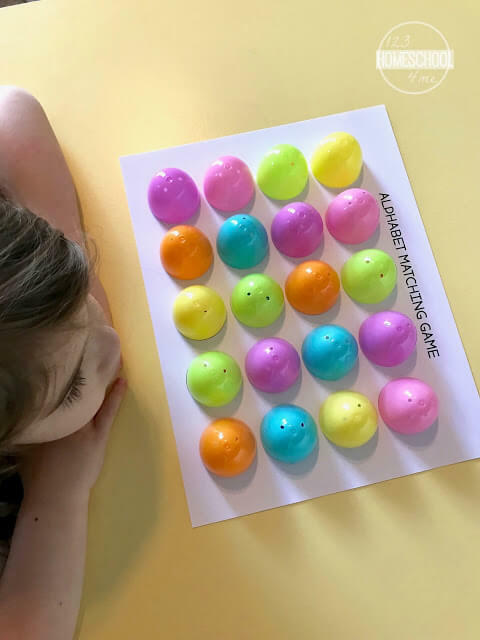 Gather all the materials you’ll need for this activity. 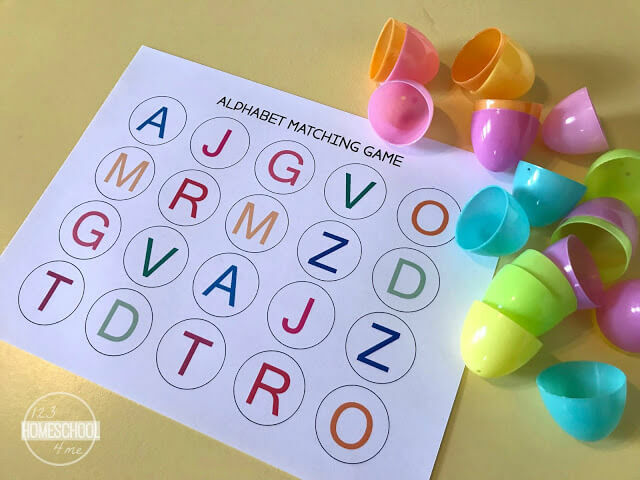 After you print the free Alphabet Matching Game Printable separate all the plastic Easter eggs into two pieces. 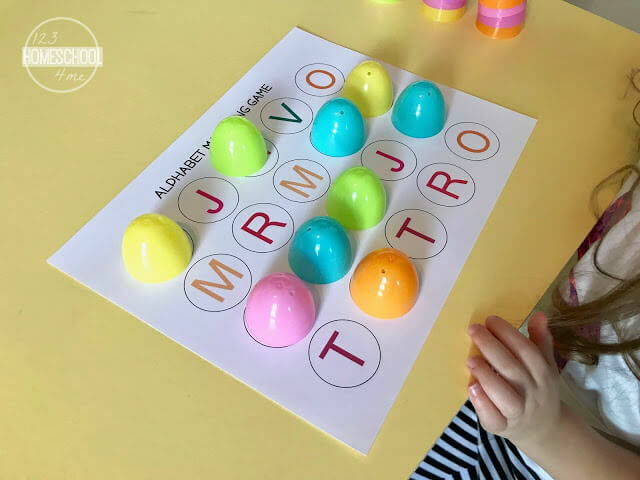 Then place one half of a plastic Easter egg over each letter on the Alphabet Matching Game Printable. I have to tell you my daughter was SO excited to play this game! She was asking me all kinds of question about the eggs and what we were doing even before I got the game ready. Once I had the Alphabet Matching Game all set up I explained to Grace that we were going to play a matching game. All she had to do was lift a plastic egg and then lift another one to try and find the match. I told her it was just like the picture matching game we had played before. Once she got started her eyes light up! She was having so much fun trying to match all the letter. I had Grace play the game by herself this time but the next time we play I’ll play with her. That way I can get in on the Easter egg action. I’ve actually included 3 different Alphabet Matching Game Printables in order to cover the entire alphabet. 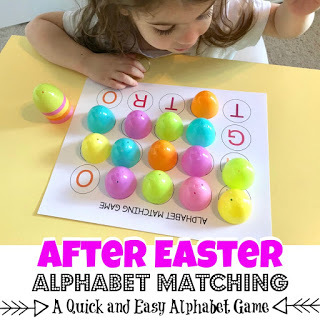 This After Easter Alphabet Matching Game was SO much fun! It’s a great way to teach letter recognition and also review the alphabet at home or in the classroom. This game was a blast and we will be playing it again very soon! I hope you use those left-over Easter eggs and your kids love playing this game too!